Connie Baxter Marlow and Andrew Cameron Bailey share about thier book The Trust Frequency: Ten Assumptions for a New Paradigm, Andrew's for-profit climate restoration startup Sacred Earth Enterprises, and The First Fifty Years. Andrew and Connie present "Climate, Consciousness and the Indigenous Connection" with Anuk Bald Eagle and Sally Ramney at the Third Street Center on January 3 at 7pm with support by Davi Nikent. 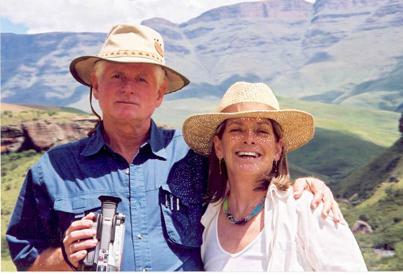 Andrew Cameron Bailey and Connie Baxter Marlow in the Drakensberg Mountains, South Africa, during the filming of their movie “IN SEARCH OF THE FUTURE: What Do The Wise Ones Know?"